Most of my SoCal friends and readers know Charlie Garrison. Several Santa Cruz friends met him this year, too. If you don’t know Charlie and his wife, Bridget…you need to. They are one of the coolest couples, some of my best friends in the world, and God is all over their life with big things in store. But there is one thing in particular that Charlie has sucked at in the past. It’s called blogging. This was his first attempt. But he’s giving it another go. So if you don’t know Charlie, get over to his new blog and get to know him. 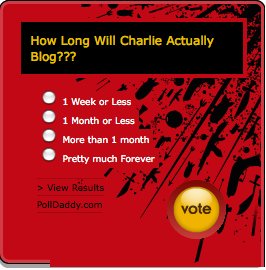 If you do know him, and even followed his last attempt at a blog, go weigh in on this poll and encourage him to keep it up!